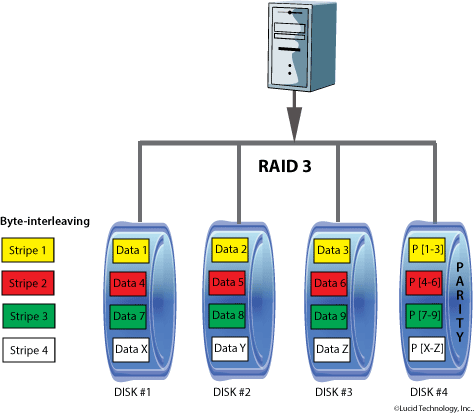 A Level 3 RAID architecture assumes that each disk drive in the array can detect and report errors. If we have ‘n’ data drives, the ‘n’+ 1st byte is back on the first drive, etc. until we have a block of data n-times the single drive sector size interleaved across the ‘n’ data drives. A single dedicated parity drive is used. Each logical sector of the ECC drive contains the bit-wise exclusive-or (XOR) of the corresponding sector from each data drive. This is the same scheme as is used in parity memory. thus the effective seek time is subject to the slowdowns. Write transactions require a read transaction, a seek by all drives, including the ECC drive, and a write to all of the drives. we discussed for RAID 2. It is well suited for most applications requiring sustained high-speed transfers. since a sector size like the 1536 above is usually not accommodated. such as image or video processing systems, where the data has been collated and organized by pre-processing so that it can be used directly by the processor. It performs poorly where the I/O transactions are for small amounts of data, or where requests for multiple files are interspersed. Thus, it is a poor alternative for any transaction or multitasking system, such as database, file servers, or general purpose workstations.